Standing in front of a small Moscow church last September, President Vladimir Putin told journalists that he had lit candles inside for people who had been injured or given up their lives defending Novorossia. 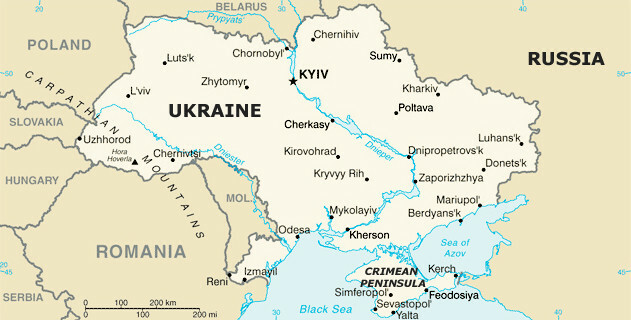 The historical term, meaning “New Russia,” was first used by the president last April and was subsequently picked up by insurgents in Ukraine’s east to define their effort to spread their anti-Kiev rebellion across the country’s southeast – the same large region north of the Black Sea that became known as Novorossia after Russia conquered it during 18th-century wars with Turkey, and that became part of Ukraine after the 1917 Bolshevik revolution. Russian conservative ideologists and Putin himself used the term to justify their claim that it was the Kremlin’s duty to protect the interests of ethnic Russians there. In June, amid the pro-Russian rebellion in Ukraine’s east, Novorossia was proclaimed by rebels as a separate entity with its own parliament, flag and news agency. Novorossia was supposed to unite the self-proclaimed Donetsk and Luhansk people’s republics into a confederation and also absorb other regions of Ukraine in the future. But last week, Alexander Kofman, foreign minister of the self-proclaimed Donetsk People’s Republic, announced that the Novorossia project had been put on hold. “The Novorossia project is frozen until a new political elite emerges in all these regions that will be able to head the movement. We don’t have the right to impose our opinion on [the Ukrainian cities of] Kharkiv, Zaporizhia and Odessa,” Kofman told the Vechernyaya Makeyevka newspaper published in the Donetsk region. His words echoed those of Novorossia parliament head Oleg Tsaryov, a former deputy of Ukraine’s official parliament in Kiev. Last month, Tsaryov told the Kiev-based Vesti Reporter magazine that Novorossia’s activities had been frozen because they did not fit into the Minsk cease-fire agreements signed in February by Putin, Ukraine’s President Petro Poroshenko and the leaders of France and Germany. The official website of Novorossia’s parliament is now offline. During recent weeks, as though in a preplanned chain of events, Russian officials have become remarkably active in stating that the Russian government wants the self-proclaimed republics to remain part of Ukraine. “At all levels, including the presidential one and in other formats, we say that we want [these republics] to become part of Ukraine,” Foreign Minister Sergei Lavrov told government newspaper Rossiiskaya Gazeta last week. “They have unveiled their own constitution project in which they talk about their status as envisaged by the Minsk agreements: The republics will become part of Ukraine, followed by constitutional reform that will solidify this status into a permanent one,” he said. A month earlier, Putin had something very different to say about the same subject. “I believe that – provided that the Minsk agreements are implemented – it is possible to find some elements for restoring a sort of common political field with Ukraine. However, in the long run, of course, ultimately the final say about how and with whom to live and on what terms should belong to the people who live in those territories,” he said during his most recent call-in show on April 16. Leaders of the Donetsk People’s Republic were already proposing their own amendments to the Ukrainian constitution back in February, suggesting that they intended to remain part of Ukraine. Analysts interviewed by The Moscow Times said the change of rhetoric demonstrated that Russia had been using the prospect of the further expansion of the self-proclaimed entities into Ukraine’s southeast as leverage during negotiations with the West and Ukraine on how to resolve the crisis. At the same time, Andrei Piontkovsky, an opposition-minded Moscow-based political analyst, said that Kremlin policymakers have realized that they had reached levels of tension with the West that they cannot afford. “In order to maintain the level of tension, the Kremlin would have had to escalate the crisis further, which would have meant more victims among Russian soldiers and more sanctions,” said Piontkovsky, a senior researcher at the Institute of Systems Analysis of the Russian Academy of Sciences. Andrei Kolesnikov, a senior associate at the Carnegie Moscow Center think tank, noted that the end of the Novorossia project was announced shortly after U.S. Secretary of State John Kerry met with Putin in Sochi for the first time since the Ukraine crisis unfolded at the end of 2013. Assistant Secretary of State Victoria Nuland followed hot on his heels with visits to Kiev and Moscow. In an article published on the Carnegie Center’s website last week, Kolesnikov said that it was possible that during those negotiations, U.S. neutrality or silence with regard to Russia’s annexation of Crimea was offered in exchange for Russian support for the reintegration of Ukraine’s rebellious regions. “Putin has offered the Americans a draw: They close their eyes to the Crimea issue, while Russia freezes the conflict in Ukraine’s east. This is a lucrative option for the West, but Ukraine cannot like it,” Piontkovsky said. In the same interview with Rossiiskaya Gazeta last week, Lavrov made a point of mentioning that the question of Crimea had not been brought up by Kerry during his meeting with Putin. “Draw your own conclusions,” Lavrov said at the time. According to Fyodor Lukyanov, chairman of the Council on Foreign and Defense Policy, a think tank with close links to the Foreign Ministry, pro-Russian insurgents in Ukraine’s east have realized that Moscow will not support their independence or make them part of Russia. “Despite their declarations, they understand that they want to stay within a unified Ukraine. The Kiev authorities will reject them [the rebels’ reintegration terms], but in that situation they can portray themselves as proponents of peace,” Lukyanov told The Moscow Times in a phone interview. As a result, analysts say, Russia and the West have reached a situation in which the crisis has been defused – at least for a while – with neither side losing face. What remains unclear, however, is how the Ukrainian government will react if Russia and the U.S. really have reached a deal behind its back.